Hosting a SDDA-sanctioned trial is extremely rewarding, but it’s also a huge responsibility. Both the organization and the competitors want to be sure that your trial is fair, organized and fun. Here are some guidelines for hosting a successful trial. Before hosting, consider these three suggestions to help you prepare. These are not required but will be very helpful. Familiarize yourself with the requirements as laid out in the Master Rule Book with regard to scheduling, supplies, search areas and odour care. You will find this information in the Hosting a Trial Section. Find a trial location and get it approved by the SDDA. You can do this in your application form but it may help to have it reviewed beforehand so that the application process goes smoothly. Contact a judge (see the Contact Us page on this website) and determine availability. The judge may ask you questions regarding your venue as well. If you are hosting an Excellent trial confirm that your potential judge is qualified to judge that level. He/She must have judged at least two Advanced trials or one Advanced trial and shadow-judged an Excellent trial. Please note that hosts may hire the same judge twice only before being required to use a different judge for their next trial. Send your application at least 2 months in advance, earlier if possible, so that there is time to devise a Premium List and promote the event, plus, it may be possible that your date conflicts with another trial already approved in your area, in which case you will need to reschedule. Once you have determined the likely number of entries you will receive, contact Stacey@sportingdetectiondogs.ca to order your Q ribbons and score sheets. Ten business days minimum notice is recommended so that there is time to mail them to you. Title ribbons can also be purchased from the SDDA if you wish by contacting Stacey. You will be billed only for the title ribbons you award and cannot return. Submit a Trial Results Sheet for each Component held. These can be downloaded from this website HERE. There is also a periodically updated spreadsheet available that you can use to record and submit results electronically. Score sheets, Q ribbons and Title ribbons can be returned after the trial unless you wish to keep them for a future trial. What else do you need to host a SDDA Trial? 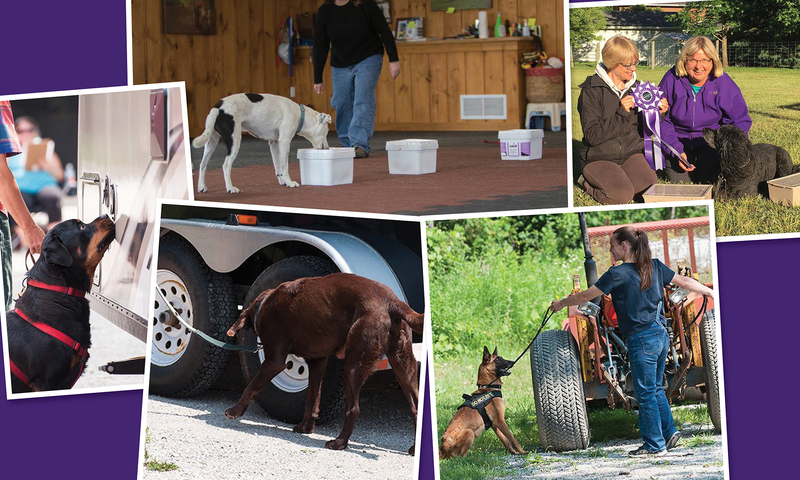 If this is your first trial, discuss with your judge and/or the SDDA board (email info@sportingdetectiondogs.ca) what supplies you have and what you still need to acquire. Identify a Secretary who will be the main contact for competitors who have questions about your trial. This is also usually the person who fills out the score sheets and provides sorted sheets to the judge, so he or she must be organized and responsive to questions. Volunteers or staff to cover check-in, gate steward, timer, judge’s steward, box setter jobs, scoring, and other roles as needed. A Premium List that will be sent out to SDDA Registered Participants once approved by the SDDA. Three days after this notification, you may make it available on your website (if applicable) and to the general public. It will also, at that time, be posted on the this website under Events. Enough dogs in your region that are trial ready. We have found that on average a single day trial can accommodate up to 75 runs (that is, 25 dogs per component if you are offering three Components/one Level). What if I need to make a change to a trial? If the Premium List has already been sent out and people are entering based on that Premium, then you must inform all your trial registrants of the changes and offer a refund if the changes cause an inconvenience. Remember a minor change to one person may not be minor to another. You must also notify the SDDA Secretary and send a *revised* Premium List so that the new link can be posted on the website. Make sure you have more than enough of everything from pens to containers to vehicles. Stuff breaks, gets lost or can get contaminated so be prepared to replace anything at an instant’s notice. When bringing your containers out of storage or from your vehicle, make 100% sure that your scent containers are not stored with or near your clean containers. Even residual odour can transfer easily to nearby objects. Scent containers (including lids) should either be new (never used) or have only ever had one single odour in them. They should have never had food, cocktail odour or pine if it is a wintergreen container. Make sure to have perfectly clean distractors and swab holders available. Provide them in their original packages if possible so the judge does not have to wonder if they’ve been stored improperly or otherwise contaminated. Obviously, swabs must be clean as well, not stored with odour and there should be plenty of them. Have de-odourizing spray on hand for bodily function accidents or areas contaminated by a competitor with food or by an exposed swab. Prepare score sheets ahead of time. It seems obvious but can be laborious so leave plenty of time for it. Make sure you have enough spares in case of move-ups or damaged sheets and also copies of them for any shadow judges. Official score sheets are provided by the SDDA. Shadow judging score sheets can be downloaded from the website or copied from the official sheets by the judge applicant or the host. It is not the judge’s responsibility to provide them. Ensure that your search areas are as clean (and safe!) as you can make them. Especially for Started teams, wash your vehicles and thoroughly clean up any accidents. Avoid using the same search areas for training at least one week before your trial. Clearly mark any areas at your venue that are not to be accessed prior to the component held there or at any time. Or conversely, clearly mark where competitors should go. Competitors should not have to guess where they can potty their dogs or find out they’ve accidentally entered the Exterior Search Area. To the best of your ability, prevent any loose dogs or cats from entering the venue. If this is somehow unavoidable, put up a visual barrier. Make sure you have enough help. Treasure your secretary and let him or her work in a quiet area. Prepared and considerate timers, runners (to call up teams if needed and to retrieve completed score sheets) and gate people can make or break the trial experience for competitors. Consider changing your running order for each component. This will prevent the same teams from encountering the freshest hides at the beginning and the most contaminated search areas at the end of the order. Ask for help or advice if you need it. There are no “stupid” questions. 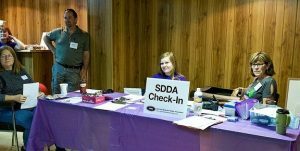 The SDDA board is more than happy to clarify anything or suggest options to ensure that your trial is a great experience for all. $200 per day to each judge up to 75 runs. Additional runs: add $5 per run. Visit our SDDA Forms Page to download the required material.